Today, after I discovered that my volunteer tutoring program in Echo Park was closed today due to spring break, I found myself with a few Adorable Monster free hours on my hands. Jetting down Sunset in my Prius blasting Death Cab (so very indie lame of me), I drove past the Sunset Junction and made a screeching left turn, deciding this would be a good afternoon to pop into The Cheese Store of Silverlake, a lovely little shop specializing in artisanal cheeses from all over the world. 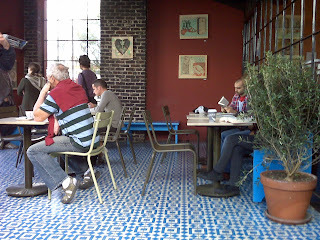 After my fab experience at Comme Ca the other week, I think I caught the cheese bug again (click here to read my review). As I walked through the door, I was immediately hit by the pungent smell of cheese, leading me to wonder if it's something you cease noticing if you work there. 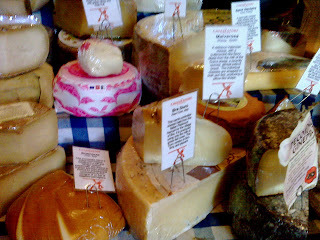 Stacked all around the central counter, were mounds of cheese with labels identifying them, too many to even contemplate. The cheerful woman behind the counter asked me what was my poison. I inquired after Napoleon's favorite cheese, Epoisse de Bourgogne that I sampled at Comme Ca. It's a pungent, washed rind cheese that holds up brilliantly to Bordeaux, or any other serious wine you can throw at it for that matter. She replied that they did, but only sold it as a block for $24.99. Promising myself that I'd return to purchase it the next time I had reason to celebrate something with cheese, I inquired if she had something similar she'd recommend. She promptly pulled out another gooey cheese and sliced me a piece, that I gobbled up, and between chews, mumbled that I'd take it. The cheese was Tomme Du Burger, a sheep's milk cheese made in France. It's intensely fatty and pungent, and like the Epoisse, should hold up nicely to wine, particularly of the Rhone variety. Impressed by her selection, I asked for a contrasting cheese I could munch down after indulging on the Tomme Du Burger. She pulled out a hunk of cheese and carved a slice, that immediately called to mind a richer parmesan reggiano. I discovered the reason for this that the cheese is made from whole milk instead of skim milk, like parmesan reggiano. The cheese I purchased was a raw milk cow cheese from Switzerland called Sbrinz, and its smooth nutty flavor should contrast nicely with the rich Tomme Du Berger. 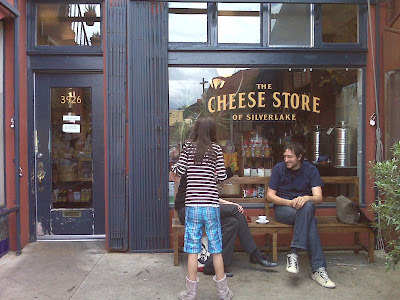 Happily armed with my white paper bag of cheese, I popped out of the store and over to Intelligentsia Coffee & Tea for a decaf brew, when lo and behold starcrossed ex-lovers, or maybe current lovers, Drew Barrymore and Justin Long hopped into line behind me. A wonderful, only in LA sort of moment. We all collected our coffees and then jetted off in our matching black Pria (plural for Prius), me on my way to Whole Foods, and them, off into movie star land. At the grocery store, I loaded up on a ton of goodies fo the upcoming week, including lovely large pork loin chops, fresh catfish filets & thick, black mussels (tonight's dinner). On that note, I plan to munch on my new cheeses tonight, after I first feed and walk The Adorable Monster. To go with them, I have fresh organic apples, La Brea bakery bread, Rainforest Crisps, the rosemary & raisin variety, and some Golden Farms Dry Genoa Salami. For dinner, I'm going to steam up the mussels in the classic French Meuniere style. I'll also make some of my famous roasted garlic potatoes and a mixed green salad. So stay tuned for the recipe coming this week. -DD's recipe for Bucatini all'Amatriciana pasta that I made with my neighbor's homemade Guanciale - it turned out divalicious beyond my wildest dreams! -And much more, so divas, stay tuned!